and about 10 mins old. Oh how cute! How sweet!!! 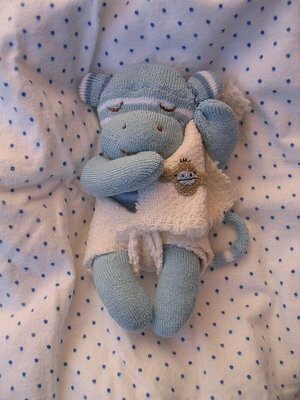 I love the tiny monkey detail on his blankie. How big is he? I expect to see his name in The Times' births announcements later this week. He's really wonderful - you could make a (small) fortune selling more like him. I am just sick in love with your stuff! It is all so cute! Do you sell these somewhere? They are just too cute for words! I agree with Rebecca above - absolutely sick in love - especially with that cutie monkey! I'm so glad I found your blog the other day! Oh. my. gosh. I LOOOOOOVE your monkey!!!!! Beautiful work! oh mollychicken. you have done it again1 something soooo adorable, original and just super cutable!! look at the diaper! the blankie! sooo cute! awwwwwwwww! Count me among the many who are so happy to have found your blog recently! I've already gone through all the archives and it's already a daily read! you ooze talent! can you send some my way?! i too just discovered your blog and love your creations. Aahhhh bless! Shhhhh don't wake him, ahhh he's lovely. this is beautiful. very nice work. am i repeating myself here?? this is just so so darling, love it! Happy Birthday sweet little monkey! He is so cute. Thanks for sharing your talents with us I am really loving all the mini's you are doing. *Jenny posted a link to your site a while back and I have to just tell you I'm so grateful she did. I just love your style and creations! Your monkey is to die for...LOVE LOVE LOVE IT. That is just about the cutest thing I've ever seen! So cuddly looking and just SWEET. My daughter would love this little one! Awwwww! What a sweetie. Have you chosen a name? You are killing me over here! You are definately on a roll!! I agree with everyone else! I love that baby monkey is holding a teeny and equally cute blankie, too. Gorgeous once again, you're amazing! Ok, you're killing us all with cuteness! Please promise that your next project will be ugly! This is high-level *CUTE*...i want to kiss and smell his head! This little guy brought a tear to my eye - is there anything cuter than a newborn monkey? aawww that's the cutest sock monkey I've ever seen!! i really thought that i didn't like sock monkeys until i saw yours...absolutely adorable! now this is original! very much loved little monkey! lucky little guy (assuming boy 'cause of the blue). Another amazing creation -- how do you do it? I so want that baby sock monkey! Are you taking orders? Wow! Fingers do your stuff! I'm wondering if you are taking orders as well, as I would love to get one. When looking at my boy's socks, I had a (vague) thought that I may try a baby-monkey. But when I saw yours, I was truly amazed by the result! It's the cutest little monkey in the world! And your hands have a magic touch. That is the sweetest baby sock monkey I have ever laid eyes on! I love that he is a thumbsucker too. So CUTE! I love this creation ! How do you do it ? Do you sell these?? I'd love to buy one done in pink. I have a really good friend who is having a baby girl and her whole room is going to be decorated in sock monkeys. So cute... That would be a great gift for my sister's baby.